Insects seem to love the plants in my garden as much as I do! 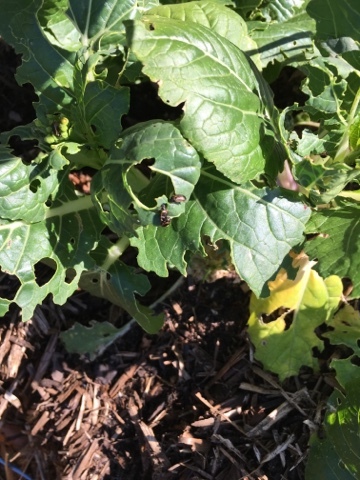 The first assault on my garden this year was the attack of the flea beatles on all of my brassicas (bok choi, broccolini, etc. ), as shown in the photo below. I learned, too late, that the best way to protect my crop from them was by using netting that lets sun and water in but keeps insects out. Once they were on my plants, it was too late. to stop the assault from the air. Some other plan of action was needed. My first move was to go to the store and purchase some Insecticidal Soap. Marketed as safe for organic gardeners, it worked like a charm. I later learned there are also sticky traps that catch the beetles when they jump or move from plant to plant, but I didn't pursue that because the soap had already done the trick. Then, aphids attacked my sugar snap peas. Cabbage worms attacked my broccolini some more. Various bugs began chomping on other plants. It looked like I was going to be needing a lot of the stuff! I began looking for a recipe I could make from home and reuse the spray bottles. Insecticidal soap is safe for humans, plants, animals and the ecosystem. Using ingredients that are found in an ordinary household, it kills bugs by dissolving their outside covering and entering their vulnerable cells. Insecticidal soap works best on small insects with soft bodies. Mix well. Use a funnel to pour it into a spray bottle. Anything that's not good for one biological creature is likely not to be beneficial to another. Meaning, the chemicals contained in the soap are not particularly friendly to the leaves on your plants. As you can see, nothing in the soap itself is inherently poisonous, but your body would not be too happy if you drank it. Similarly, your plants may thank you if it protects them from getting eaten alive, but the chemicals in the soap is not what a plant would naturally choose to be bathed in! If insecticidal soap is put on plants that are stressed, or if it is mixed in a form that is too concentrated, it can damage the leaves of your plants! Before applying insecticidal soap, it would be wise to test it on a small area of a plant to make sure it doesn't burn the leaves of your particular plants. Additionally, time of day of application can make a difference. Apply insecticidal soap after plants have been well watered, during a cool time of day, when the plants are not stressed by sun, heat, or drought. Also, don't spray insecticidal soap on flowers or on the good insects that you are relying on as pollenators for your garden. 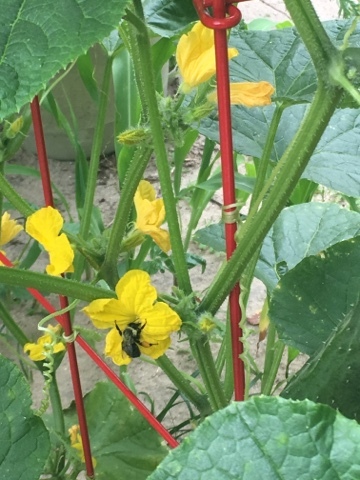 Another issue with regard to timing of when you spray is that bees and other pollenators are most active in mid-morning. Spray insecticidal soap either very early, or late in the afternoon after the bees have gone to bed. Insecticidal soap will be washed off in a rain or every time you water your plants. Use this information to your advantage. If it rains, you may need to reapply. Similarly, once it does its job of killing bugs, you may choose to wash it off the plants.